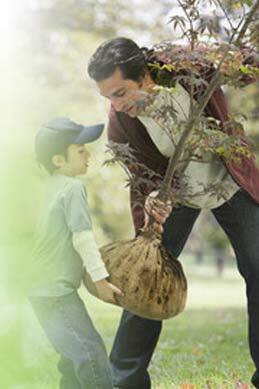 Eco-friendly living memorial .... create a remembrance planting to express your love. You may be searching for a way to turn the grief you feel over your pet´s death into something special. You have your pet´s cremated ashes in an urn, but you want to do more with them. A remembrance planting in your home or garden is a powerful living symbol. When nourished by your pet´s cremated ashes, an ordinary plant becomes a living symbol of your pet´s life. Determine where to plant - Whether it´s your pet´s favorite spot, cremation garden, or a container, you want to find the place that reminds you of your pet. Determine what to plant - a new fragrant perennial garden or a young tree, this will be the place your friend will become one with a new green life. Choose the planting that most reminds you of your pet and works best in your area. Combine the ashes with Let Your Love Grow - This organic mixture is the only solution that will lower the pH level and dilute the harmful sodium (salt) in the cremated ashes. Follow your nursery´s directions on planting, covering and watering. With Let Your Love Grow, not all cremated ashes are needed to give this nourishment. You can choose other ways to memorialize your pet with the cremated ashes that remain. An urn on the mantel can provide still another reminder of that love. The way you create that special moment can help with the grieving process. Depending on what bests suit you, you can have a group gathering or take a quiet moment by yourself. The most important thing is that you create your remembrance planting in a way that comforts you best. The sight of a remembrance planting and the action of caring for it, offers a nurturing reminder of your pet. Just as the plant nurtures you, your pet nourishes the plant, completing the circle of life and letting your love grow. Even more, you may be gratified to know that out of your pet loss came something positive. Not only did you add more green to the environment, you also made it possible with this eco-friendly product. Pet Loss Care Memorial Center is pleased to offer this amazing product - contact us for more information.